All the iPad users, including me, have been waiting for Facebook app for iPad ever since. But as reported today by Mashable, Facebook for iPad will be launched at Apple's iPhone 5 event which is to be held on 4th October 2011. Also, it its expected that Facebook will be pushing updates for its iPhone app and may unveil an HTML5-based mobile app marketplace. 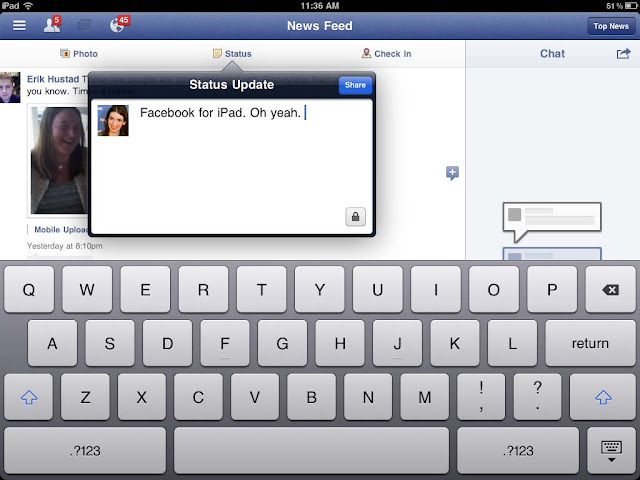 Facebook for iPad was leaked earlier this year and was used by many people in their iPads. But soon afterwards, Facebook closed downthat leaked app and users were unable to log in to their accounts using that app. Still there are tutorials available around the web that will teach you how to install Facebook on your iPad etc. But who cares when the official app is about to be released? 0 Respones to "Facebook App for iPad will be Launched at Apple's iPhone 5 Event"